It has a small single burner and a lovely unusual chimney which has a "Pyrex, Made in England" stamped on it. It measures 14cms to the top of the burner and 26.5cms to the top of the chimney. 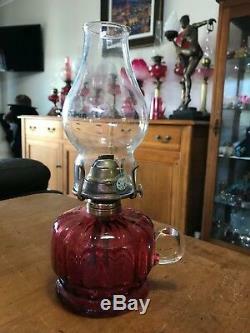 A beautiful little lamp to add to any collection. 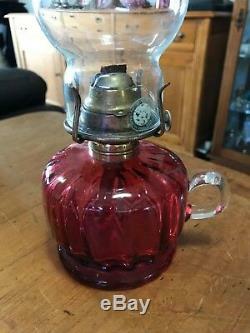 The item "AntiqueArtNouveauRubyCranberryPinkGlassOilKeroseneFinger LampLight" is in sale since Monday, January 21, 2019. This item is in the category "Collectables\Homeware, Kitchenware\Lighting\Non-Electric Lamps\Kerosene". The seller is "aniquew123" and is located in Bateau Bay, NSW. This item can be shipped worldwide.